I was very excited when Kylie Bertucci announced the launching of the Global Design Project challenge site. The team of people involved are all SO talented that I'm sure it'll soon be a great source of inspiration to all of us. This first colour challenge has really reinforced for me the creative and growth value of doing challenges. These are definitely not colours that I use much - either together or individually - but I like the result so much, I think I'll be using them again! I stamped the front flower with the new Basic Black Archival ink, masked it, stamped another flower, masked that and stamped the third flower. Then I masked that flower too before stamping the background using the baby wipe stamping technique with the three inks; Smoky Slate, Pink Pirouette and So Saffron. I watercoloured the flowers, using Pink Pirouette for the flowers, to which I added a little Smoky Slate for the flowers at the back. The flower centres are So Saffron with some Smoky Slate shadows and the stems and leaves are So Saffron and Smoky Slate. I added a little bit of Smoky Slate shading around the bunch of flowers. The painted panel is layered onto Smoky Slate and Pink Pirouette card stock. The sentiment is from Birthday Blossoms. I cut it with the smallest of the rectangular Tags & Labels framelets and extended the length using the method I describe in this post. Then I edged it with So Saffron. Thank you for looking at my card and I would welcome any comments. 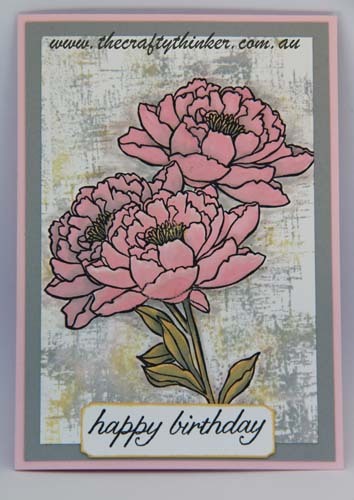 Stephanie - Your flowers really pop against this beautiful background you've created with the stamp set. What a beautiful card! 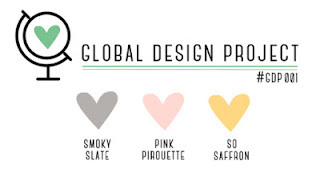 Thanks for playing along with this week's Global Design Project color challenge! Stephanie, you are braver than I am to use only the challenge colors to watercolor these flowers . I could have sworn the stems had green in them. Very inspirational. The background is amazing too. Thanks for joining us at Global Design Project. 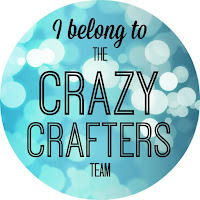 Thank you - I'll take your "brave" - I was thinking crazy! Smoky Slate is a bit of a cool grey so mixed with yellow it does produce a green effect but the yellow is doing most of the heavy lifting. Thank you Louise - it was fun. Thanks Kylie! Sadly, I'll have to miss a couple of challenges but look forward to checking in again as soon as I can.